Arrival at Jogja Airport, met by our friendly English Speaking Guide, direct Jogja city tour visit Kraton – the magnificent Palace of Sultan. Continue to Taman Sari water castle, bird market, then onward to visit a traditional batik home industry. Next visit Kotagede to see hundred year old tradition still being practiced by silver craftsmen. Explorer at Jalan Malioboro, very famous for hunting handycarfts and souvenirs. Lunch and dinner at local restaurant. After dinner transfer to hotel. Breakfast at hotel. Visit LAVA – from last eruptioned of Mount Merapi with its fired plantation and everything with more than 1000 centigrade. Drive to Borobudur temple, Pawon and mendut temples. Then return to Yogyakarta enroute stop at the Agro Toursm Village to see Salak Pondoh. Lunch and dinner at local restaurant. Overnight at same hotel. 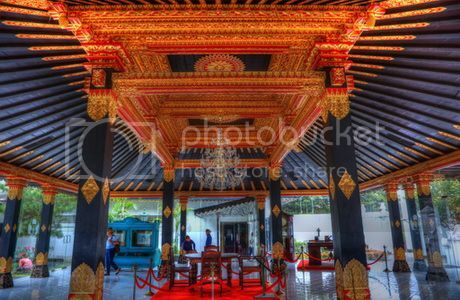 After breakfast, drive to Solo – sister city of Jogja, visit Mangkunegaran Palace and witness the fascinaty display of gold plated dance ornament, jewelries, bronze, and wooden mask collection. A short stop at Triwindu flea market, and a traditional market – Pasar Klewer. Lunch at local restaurant in Solo. Shopping at PGS / Solo Shopping Mall. Late afternoon back to Jogja. Dinner at local restaurant. After dinner transfer to hotel. Breakfast at hotel. Transfer service to Jogja airport. Arrive at the Jogja airport, meeting service thence direct visit Sultan Palace, Water Castle, Bird Market on to Old Town Kota Gede as the Center of Silver works. Then transfer to Manohara hotel in the foot of the Borobudur temple. Lunch and dinner at local restaurant. 04.00 AM. climb up to the temple to see the beautiful view before Sunrise (Depend on weather). 07.30 AM. Return to Hotel for breakfast and take shower. 08.30 AM. Visit LAVA – from last eruptioned of Mount Merapi with its fired plantation and everything with more than 1000 centigrade, drive to Yogyakarta enroute stop to see Agro tourism village to see salak pondoh. Transfer to Hotel at Jogja city for overnight stay. Lunch and Dinner at local restaurant. After breakfast at Hotel, full day tour city tour visit Malioboro street – famous place for hunting souvenirs. Then to “Beringharjo market” as the biggest traditional market in Yogyakarta on to “Kasongan village” as the center of clay pottery home industry, continue to Parangtritis beach while waiting for sunset. Lunch & dinner at local restaurant. Breakfast in hotel. Then transfer to Jogja airport.